Your audience’s attention will fade over time unless you take specific steps to keep them engaged. 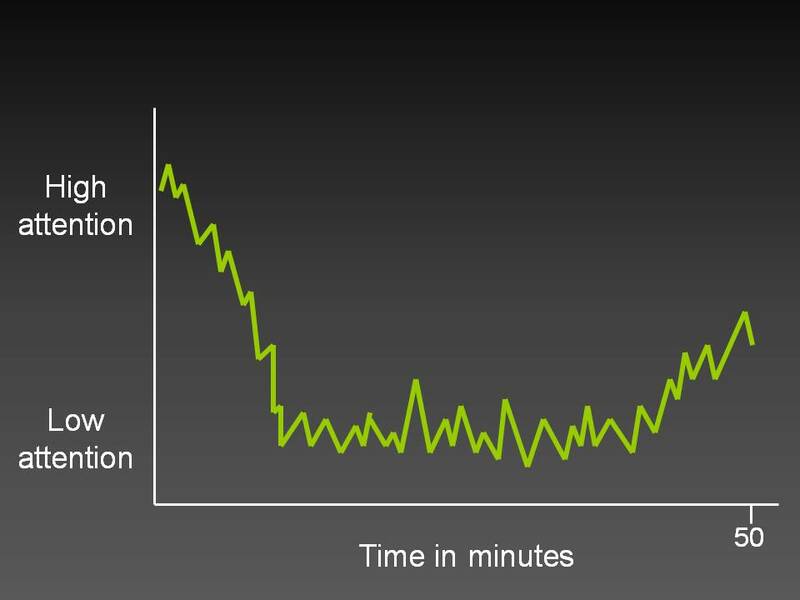 Here’s a graph showing the attention of university students during a 50 minute lecture – where the lecturer lost his audience (Reference: Hartley J and Davies I “Note taking: A critical review” Programmed Learning and Educational technology, 1978,15, 207-224). And the students perked up their ears again and refocused to get the gist of the lecture. Here’s what happened – the lecturer stumbled upon the audience’s Attention Reset Button. Although our attention span is limited, we do have the ability to refocus on a task. When you push the Attention Reset Button you’re giving your audience that opportunity to refocus. So that’s what you need to do when you’re losing your audience. Push your audience’s Attention Reset Button. Instead of fading to near zero, your audience’s attention will spring back. But be aware that your audience’s attention span will vary according to many factors – warmth of the room, time of day, how much sleep they had the night before, how intrinsically interested they are in the topic. Be prepared to adjust to the needs of your audience. For instance in the morning you might plan for intervals of 15 minutes between each Attention Reset. During the potentially sleepy after-lunch slot you might decrease that to 5 minutes. Nobody can not pay attention when the rest of the audience is laughing. We want to know what’s funny. The critical caveat is that your humor should be relevant to your presentation. it gives them an opportunity to get back on board. There’s a live element to a Q&A session that keeps people hooked. Build Q&A into your presentation, rather than leaving it till the end. Change what audience members are doing eg: from sitting down to standing up. Allowing people to process your ideas by asking them to talk to the person sitting next to them is an excellent way of re-engaging them. For example, you could ask them to share with their neighbour “What are three things you’ve learnt so far in my presentation”. Asking people to reflect by writing is also useful. For example “Write down three things you’ll do differently as a result of my presentation”. In a longer session take a break for people to stretch their legs, use the restroom and refresh their drinks. Don’t be one of those people who tries to spice up a deadly dull presentation with cartoons or funny images which are not conceptually relevant. It looks desperate and research by Richard Mayer (the guru of multimedia learning) shows that it harms the ability of the audience to take in your core message. What ways do you have of pushing your audience’s Attention Reset Button? Hi Olivia. Thanks for some great tips! I’ve been using your presentation planner quite a bit over the past few months and I think that in itself makes it really easy to build in ‘attention reset button’ moments. 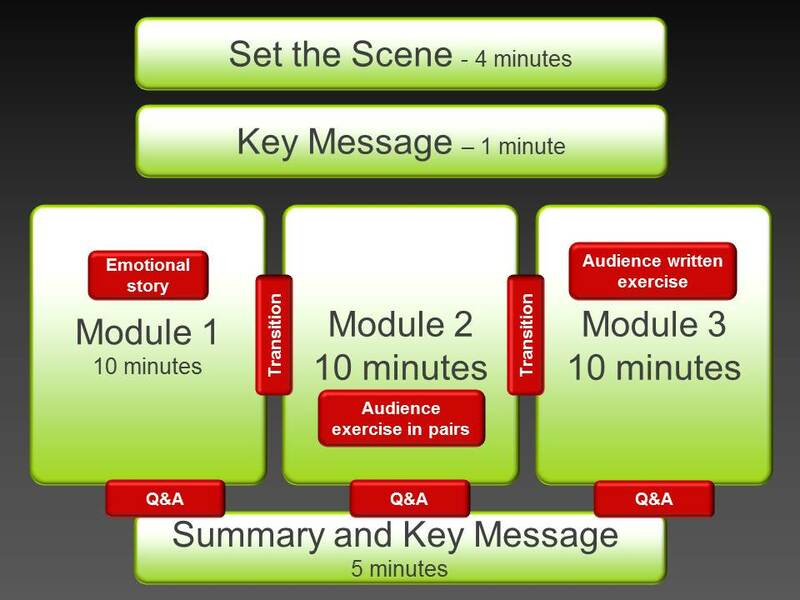 In particular, the signposting to ‘open’ and ‘close’ each section of module provides the transitioning you mentioned above and the opportunity for a distracted audience to catch up and get back on board. On a couple of occasions I’ve also had mini Q&A sessions at the end of each module or section, just like you’ve suggested above, which has worked really well. I’m delighted that it’s working so well for you. Great advice, it’s amazing how doing even one of these things to start out can make a world of difference when presenting. You have some great tips here that many speakers will benefit from studying, then implementing. This is a great post with EXCELLENT tips! and very well presented too. Pertaining to point no 5 “Get them to talk’, sometimes I ask them in subgroups to discuss :one example of what we have just discussed; one point of disagreement; and generate one question. This ‘theme’ based discussion takes the session forward, with the facilitator also getting some feedback as to where the group is! Thanks Rashmi for adding those suggestions. I can see that they would work very well for generating useful discussion. Great post & I’m glad to discover your blog. One thing I’d add to suggestion #4 above (“Change Something … Anything”) — here is where graphics can really come into play. You’re right to suggest “change the visual aid,” and I’d just add that attorneys should think creatively about using multimedia presentations. Instead of a standard PowerPoint, for example, try a video-enhanced PowerPoint or a 3D animation, for example. Great tips – thanks again. Thanks Morgan – yes, adding a short video or other multimedia element can reengage an audience. Execellent information and a great reminder. 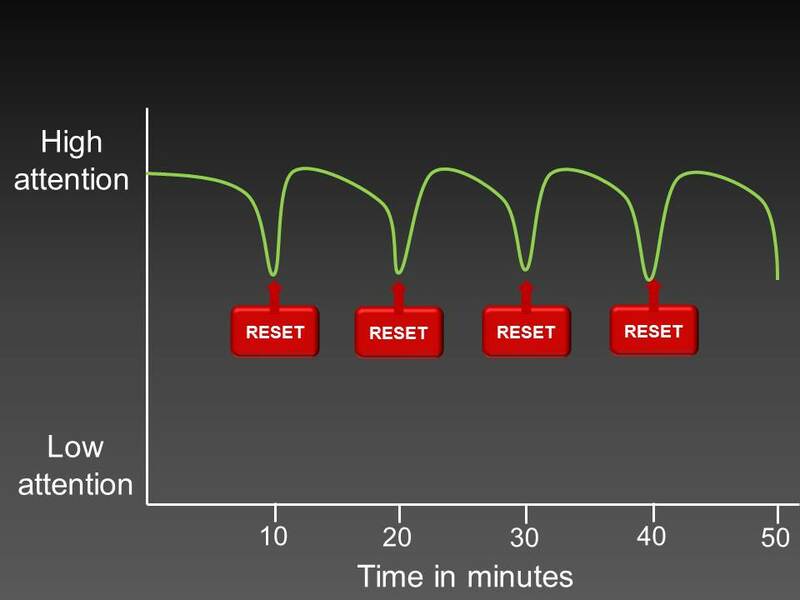 I personally have migrated over the years to the “magical number 7 plus or minus 2” for the number of minutes between resets (which fits nicely with the 5 – 10 minute rule, but it has a scientific basis (:-). Also, re getting them to talk, I am a big fan of asking the audience to discuss the pros and cons of an idea. I often challenge them to use the “GBU” evaluation of techniques or solutions that have been presented, meaning they should attempt to identify what was Good about it, what was Bad, and what was Ugly (generally meaning something they didn’t really like but couldn’t explain why). This technique guides the discussion and gets them to focus on more than one aspect. Love your GBU process – thanks for adding it. Getting back to attention span, in my research on the scientific literature I haven’t found anything which gives me the confidence to say “An adult’s attention span is X minutes”. That’s why I’ve referred to “10 minutes” as a practical guide which should be varied depending on your audience, topic and external circumstances. Thanks Olivia for a great, practical “how to” post. One thing I might add that is more preventative–but can be used throughout–is the process of “salting”. Just as consuming salt will make you thirsty, “salting” your opening with the most relevant, WII-FM “here’s how this will help you” points, you’ll increase their interest level from the beginning. Then, throughout, you can mention “In a minute…I’ll be sharing with you an idea that will help you dramatically increase…” type comments. Finally…a big thumbs up for the story-telling recommendation. Adding more stories to your presentation is a sure fire way to dial up the interest level of your presentations. Again, thanks for a great post. Thank you David, that’s a great suggestion. I loved the graphical facts. Great Post, Olivia – it spurred me to follow you! I find that conjuring tricks work wonderfully well as visual metaphors and get people fully engaged and highly receptive. When I get it wrong, people assume that I’m doing it on purpose. I also present intriguing conundrums that are incredibly ‘simple’ (once you get it) as an introduction to ‘dual-process’ theories of reasoning and rationality. ‘System1’ (an evolutionarily old system?) is associative, automatic, unconscious, parallel, and fast, with processes that are innate and employ heuristics which evolved to solve specific adaptive problems. ‘System2’ (a more distinctively human system? ), is rule-based, controlled, conscious, serial, and slow, with processes that are learned, flexible, and responsive to rational norms. Widespread cognitive illusions, such as the conjunction fallacy*, can be ascribed to System1, while superior individual performances can result when System2 processes override System1 responses. I want people to be as aware as possible of the way that S1 thinking can impact on – and might impair – S2 thinking. System1 thinking keeps most people running on habit. Having presented a conundrum, I ask people to stand up if they’ve got the answer. Most people stand up for the ‘obvious’ i.e. predictable answer. I’ll ask the others for their answers then invite a short debate which is interesting on many levels, not least the emotional attachment that people have to the [wrong] answer, even though I’ve told them it’s wrong. The process can last anything from five to 15 minutes then, ostensibly, I move on to something new. I’ll return to the puzzle from time to time in the process of the workshop. Well, not the puzzle so much as people’s thinking processes before, during and after, say, an expert. There are three moments that are particularly delightful. When someone finally figures it out, when someone realises how much effort they’ve put into something so simple, and how tenaciously they have been clinging to the wrong answer despite knowing that it is not correct – and recognising how this mirrors a long-term pattern that does not serve them well. Come to think of it, something else usually happens, which is that the revisiting creates a shared experience that everyone can relate to, so the delight is shared and creates a bonding. A delegate who is afraid to engage in role-playing, for example, or a person who gets agitated because the training stirs some discomfort, or someone who allows themselves to get frustrated and angry because someone writes or says an ‘offensive’ word. All S1, which is not to say that there’s anything wrong with it as such: Malcolm Gladwell’s Blink: The Power of Thinking Without Thinking (2005) claims that spontaneous decisions are often as good as—or even better than—carefully planned and considered ones. *conjunction fallacy: When two events can occur separately or together, the conjunction, where they overlap, cannot be more likely than the likelihood of either of the two individual events. However, people forget this and ascribe a higher likelihood to combination events, erroneously associating quantity of events with quantity of probability. Thank you for adding so much value with your comment! My partner Tony is a magician and also at times incorporates magic tricks. But you’re right that those of us who are less skilled can create puzzles that provokes thinking and reflection. Your article is incredibly well written and I was nodding my head the whole way through. 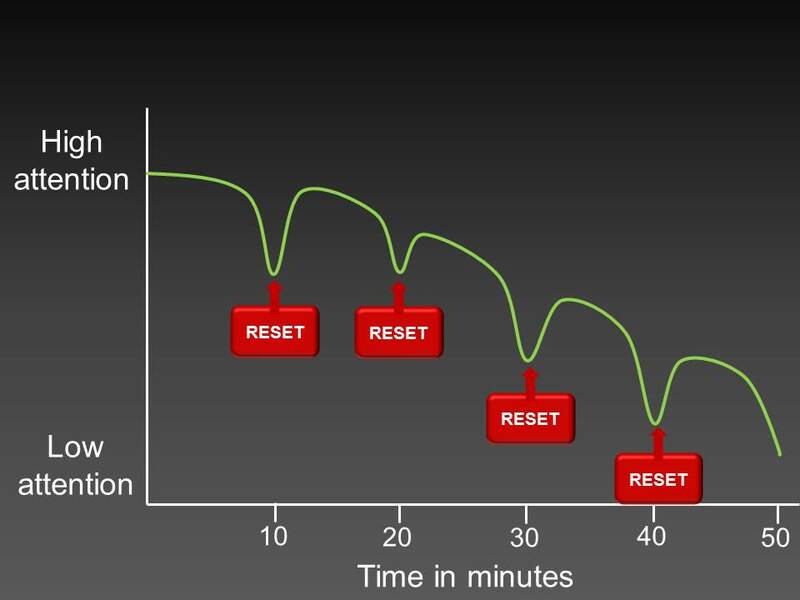 I love the idea of a reset button–especially in this adult ADHD age. having folks get up to vote on something or write on the board, games and competition, prizes, relevant trivia, and asking for audience volunteers. May I share this article with our clients? The Speech Improvement Company, Inc. Thank you Laurie for your appreciation and thank you for adding your ideas to this post. Yes I’m happy for you to share this article with your clients. Excellent! I use many of your suggestions w/ great success. Thanks for sharing. Excellent, succinct article with easy-to-remember points. I’d like to share at my blogsite. Thank you Marla. You’re welcome to share at your blogsite with a link back to the home page of this site. This deliberate look back can help in retention and recall (Chilcoat) and ensure up to a 20% increase in remembering. Regards, and still love your blog. I just came across this blog and will certainly read more. This is very good advice. The nice thing about it is that making your talk modular not only can help keep the audience alert and reset their attention but it also works for the speaker as it can give you a way of organizing the speech in your mind. At each reset point for the audience, you get to reset your own frame. So it can almost be like giving several connected mini-talks. Whoa! You seem to have generated a pool of data regarding this topic. I love the point about 10 minute modules. I think the best way would be to put yourself in place of the audience and see what kind of refreshers would work for you. Thank you Olivia! A good read..! Olivia, great ideas in your article. Thanks! I work in the “Clicker” business and we are always trying to get our clients to understand the pitfalls of the lecture and listen style of teaching. One common push back I get is that there is too much material that needs to be presented and no time for “transitions” . How can we convince people that less is sometimes more? After 18 years of training sales and marketing professionals, I found this to be exactly the right way to get the most out of your training time. The approach outlined here maximises attention and recall for the volume of content required for the program. Great article, now the secret is out. It’s a great article. I have started using tips into my sessions and result has been coming out excellent. Got an important presentation coming up? Want to get specific, step-by-step advice from Olivia and Tony as you prepare YOUR presentation? Want to create your most engaging presentation ever? Plan your presentation with the SpeakerMap™ - a proven system that will have you feeling confident and credible. Heads up: I'll also send you useful tips to improve your presentations. If you no longer need them, you can unsubscribe at any time.